Chef Shayne McCallum is heading north to open up 8bit Darling Quarter, Sydney. Credit: Wasamedia. 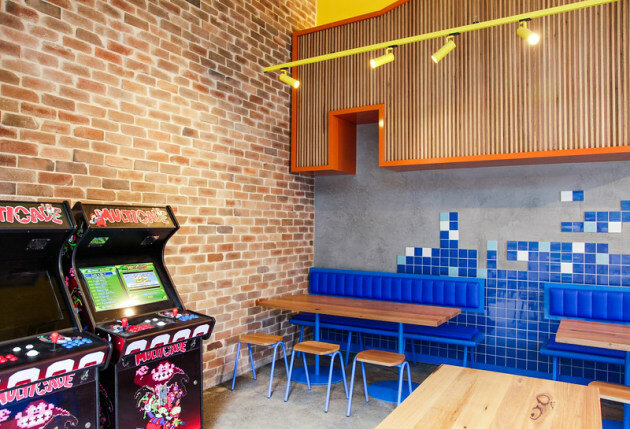 If you've lived and dined in or around Melbourne, chances are you've heard of 8bit; the American-styled, fast-food joint, where diners sit amongst pop culture-inspired vinyl wallpaper and arcade games was co-founded by classically-trained, Melbourne chef, Shayne McCallum. Since 8bit's first Footscray restaurant, McCallum has taken his flair for burger flipping all over the city, opening up a further two venues and American-style BBQ, Up in Smoke. Foodservice sat down with McCallum after the launch of 8bit's first Sydney restaurant in Darling Square and asked him about founding the cult, burger chain and why they decided to fly north. What drew you to a career in food? My father was a chef, my mother was a cook in the Army Reserve, and my grandmother was a cake decorator and teacher. I feel like I grew up in kitchens. You're a classically trained chef having worked at both one and two-hatted establishments. How would you describe how you got to where you are now with a successful burger chain? I have been cooking for 23 years and I have done all types of cooking and worked in all types of establishments. My previous job was at a pub called Captain Melville. I joined up with one of the owners, Alan Sam, and we were keen to do an American diner in the West serving fast, casual and reasonably cheap food. The American-diner styled restaurants are hugely successful in Melbourne. Credit: Wasamedia. What was your vision in opening 8bit? My original vision was to open a small shop selling American fries and hotdogs, like an American-style milk bar. We did a lot of research and decided to go down an American diner-style restaurant, so milkshakes and burgers were added. Footscray is the location of your first 8bit restaurant – why did you choose this spot? Alan is from the West and he knew the area very well. He saw a gap in the market as there was no American-style offering. It was also affordable to start a brand new business there. What challenges have you experienced since opening your first venue in 2014? With four stores, one delivery-only kitchen with Deliveroo, and many collaborations and pop-ups, we have challenges every day. The biggest challenge was when we realised that the Footscray store was so busy that we couldn't keep up with the food preparation. We had to hire a place across the road to modify into a kitchen and prep there to supply the store. We've since got a central kitchen that does all that. You've just launched your first Sydney 8bit venue, what led you to cross the border and open up a restaurant here? No, we have always thought with the strength of the brand that 8bit could go places. We were looking for locations back in 2015 but it never happened. We've been keen to get up here. Each 8bit venue features retro arcade games, a homage to McCallum's 80's childhood. Credit: Wasamedia. Are you planning on doing anything differently at the 8bit Sydney outlet? We're just bringing the same 8bit that Melbourne loves. Sydney will get a few burger specials exclusively for that store – watch this space. Are there any fast food trends you're predicting for 2018? More cheese and more things deep fried (laughs). I think it will be more gimmicky, it's already started with things like pouring cheese completely over the burger. Anything that will get a reaction on social media is the cool trend for 2018. What advice would you give to up-and-coming chefs? To all up-and-coming chefs, I would say to learn all the basic fundamentals of cookery, work at a lot of good places with inspiring, like-minded chefs, and then open a fast, casual food restaurant. All the cool chefs are doing it. For more information on 8bit, please visit eat8bit.com.au.